Adobe or Clay, also called Sandstone from some window manufacturers is the latest in exterior colors that isn't a budget breaker. This one in Coppell was formerly white. What a change. What a difference. 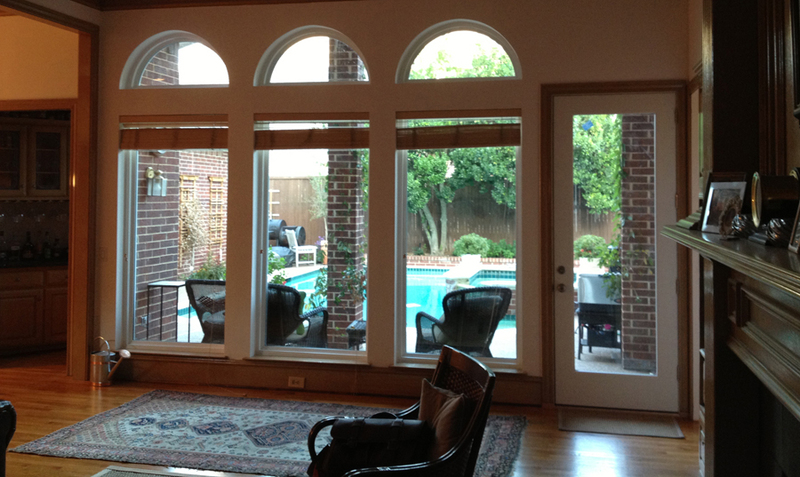 Awning Windows over Single Hung Vinyl Replacement Windows in Coppell. Great color and great design options for an updated home window look. Jeldwen Vinyl Slim Line Vinyl Windows in Beige with Colonial Lite Grids. Alside Casement Vinyl Windows with Prairie Lite Grids in North Dallas. NT Window Energy Master Vinyl Slim Line Windows as a bow window. Bow windows are among the most complicated of installations because the opening is usually out of square at least 1/2 inch or more. Skill to disperse the irregularity out among all the windows in the bow make those natural home imperfections less noticeable. NT Window Energy Master Vinyl Replacement Windows. The ones over the roof that we hung suspended by ropes were a real riot. Alside Ultra Max Vinyl Replacement Windows are also Gentek Sovereign Windows and are Preservation Series Windows. Private labeling is a method by which a company can offer windows and not have any point of comparison. It's a sales tactic that is a bit unseemley but it is done a great deal in the home improvement industry. Royal Casements are a great alternative to typical window styles like vertical operators. Double Hung and Single Hung windows go up and down, and the casement window swings open like an outswinging door. This example shows you can see the screens from the outside, but they are removable for a solid picture window look as well. This mid century modern in Dallas needed the update and got a very crisp look for the curb appeal. 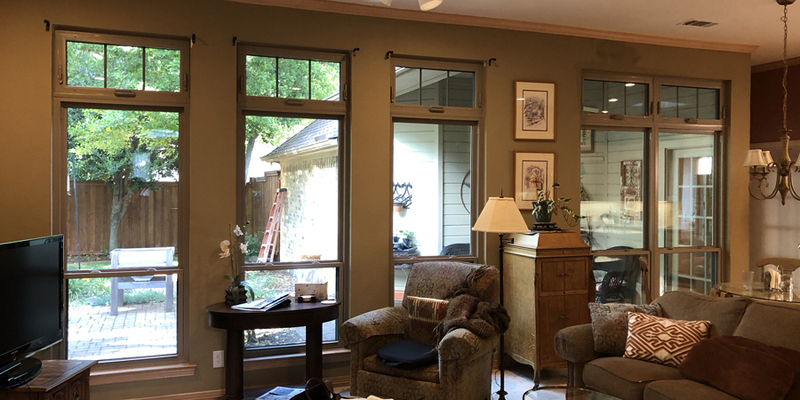 North Texas Windows (NT Window) makes this Energy Master Vinyl Replacement Window in Mansfield Texas with a Cardinal 366 Glass package from the plant in Waco. It represents a great product that is locally made for lower shipping costs and less potential breakage. We were proud to be their Energy Master Dealer of the Year in 2011-2012 and can offer this amazing product at an amazing price. It's one of the best values in the Metroplex. This is a close match to the original louvered windows from the 50's. Our before and after gallery shows the original. Many times mullion thickness is a big concern but this look works for this opening. The bottom side units open like hopper windows but are actually called awning windows. Tempered glass is used in most large picture windows as they are usually somewhat close to the ground. Alside Sliding three lite window and picture windows. These are Mezzo Windows and have a fairly narrow frame at just 2 3/4" exposed frame profile. Many vinyl replacement windows have frames that show as much as 3 3/4" of frame. These are an inexpensive vinyl window produced by a manufacturer that is no longer operating. Cheap windows are what we all want until we get them and wish we'd done something different. These mulls are so very heavy because it was a house flipper who had to get windows but couldn't squeeze out the other $500 for a narrower framed window. We want people to have exactly what they want but that being said I'm very glad this is not on the front of my house. Way too much plastic. By contrast these aluminum windows have the narrowest frames we can get but can't achieve the Energy Star Ratings due to frame conductivity. Even with the same low e glass and argon gas window glass package they just can't get the U Value needed for Energy Star Windows. These Energy Master Vinyl Replacement Windows have a U Value of .29 and a Solar Heat Gain Coefficient of just.21. Great performance and a great value. Not a bad looking view of the pool either! This is such a great option to that big triple window in the rear of the home. This provides better ventilation and a better view of the yard, removes all the horizontal lines that can break up a view and still offer great ventilation through the swinging end panels. Screens can easily be removed for the more open look as well. Frame Works Vinyl Windows are an option if the exterior color you need just isn't white or beige like a typical vinyl window. NT Window offers a painted exterior as does Maritech Windows. The Frame Works is a laminated color sheet that is applied and melted onto the exterior of a window to give it considerably more thickness and substance than painted. It does come at a premium cost though. Custom exterior colors will run up the cost between $100 and $180 per window depending on the manufacturer. Grids were once used on all four sides of a home. This was the case in the 70's and it hasn't slowed down until recently. In a modern build you will see grids on front only but not in the sides or the rear. Most homes need the curb appeal but we spend considerably more money on landscaping, pools, outdoor kitchens, fountains, hot tubs and the like to want to obstruct a view in a current context. Leaving the grids off the rear and the sides is pretty typical nowadays. NT Window Energy Master Vinyl Replacement Windows. Heat reflective glass does have some color to it. If you hate that aspect of high performance glass there are some less colorful options out there. The color is from the metal coating on surface two of the insulated glass that reflects heat back to the source. You can see the color more when you have grids in the windows. These units were in Carrollton. This one in Wylie was awesome. We do a lot of corner houses and higher end homes. They take extra care due to the value of the home itself. It's never wise to use the cheapest product or the cheapest window installer in homes with the values we see today. Most of the homes we work on are in the 350's and upwards to the Million Dollar homes. Discerning homeowners know that value isn't in the pricetag but in the end result. In many cases replacement windows can add twenty to thirty thousand dollars in home value while saving thousands in utilities. Replacement windows should pay for themselves via these two avenues in three to five years.